The last couple of meals that I had with LD (at The Cadogan Arms and Le Café Anglais) proved to be somewhat unsuccessful. This seemed to have the effect of putting a dent in my ‘restaurant choosing capability’ as this time round she suggested (insisted) that she pick the destination for our next meal out. With a sniff, I agreed. I obviously don’t get it right all the time, but I like holding the mantle of ‘restaurant picker’ amongst my friends, even if it is self-bestowed, and it isn’t a title that I wanted to relinquish easily. So this is how, at LD’s suggestion, we ended up at Marco at Stamford Bridge (sniff). The restaurant is a collaborative effort between Chef Marco Pierre White and as you might have guessed, Chelsea owner Roman Abramovich. The restaurant has the look of money behind it. The room is filled with leather cubicle seating and glamorous black and white photographs of celebrities from a bygone era. It’s dark and decadent, and if cigars were allowed, I would have almost hazarded a guess that this was an old-fashioned gentlemen’s club house. LD and I both went for the foie gras terrine (£15.50) as a starter, which had the requisite creamy texture that befits a good version of this dish. However, while it was reasonably tasty, it lacked a deep foie gras flavour. 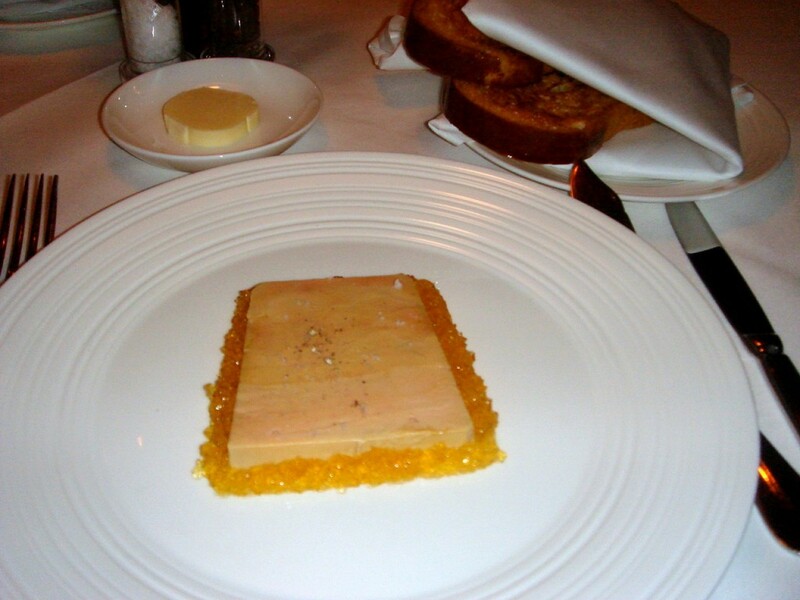 The sauterne jelly that surrounded the terrine was pleasant, although the accompanying toasted brioche could have also done with a little more sweetness and a softer core. This starter was not bad, but LD and I both concluded that we had had better. Although we didn’t try the dressed crab, this dish ordered by a nearby table looked excellent and was generously portioned. 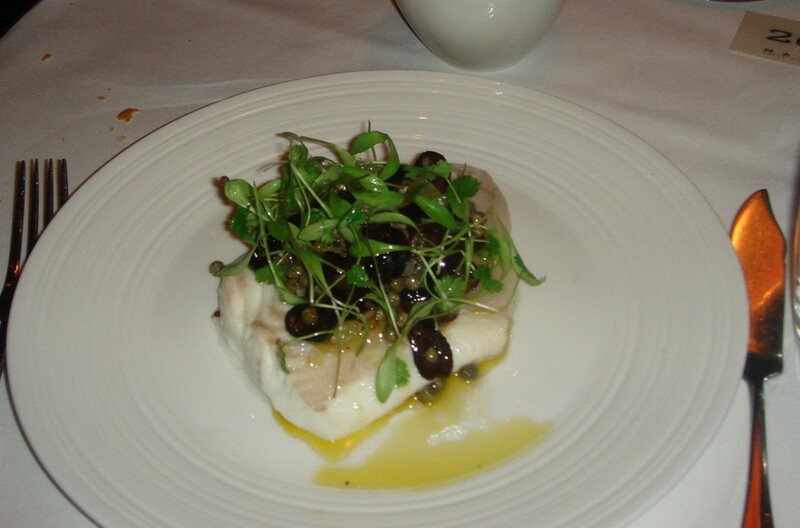 A fillet of fresh halibut (£19.50) was poached to moist perfection and dressed with a hint of lemon, olives and baby coriander for added aroma. This piece of fish was generously sized and executed with flair. However, it came with no sides, so a buttery and decadent side dish of mashed potatoes was called for. 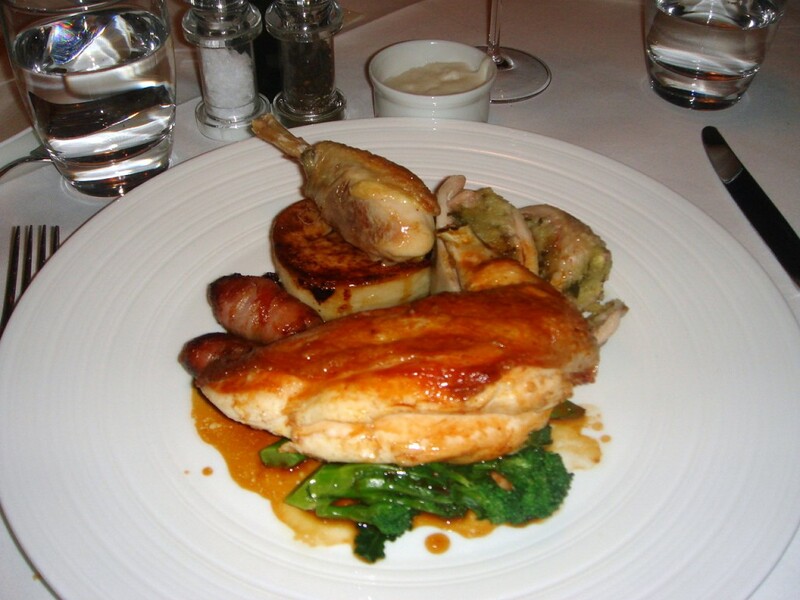 For a winter warming type of dish, I decided to go for the roasted poulet noir (£16.50). I rarely choose chicken as I think some restaurants tend to overcook it, leaving it dry. (Flashback: One example was at La Petite Maison London about two years ago when the roast chicken I had was so dry I had to send it back. Can you believe it?) But on a freezing winter’s night, I simply felt like nothing better. The roast chicken (half a whole bird) was impressively tender and moist. Notwithstanding the size of the chicken, there were accompaniments galore. In the English tradition, the sides included some very tasty pigs in blankets (chipolatas wrapped in bacon), a nice creamy bread sauce, and some very flavoursome pan juices (of which I had to ask for more). Other veg included purple sprouting broccoli (in season right now) and potato fondant, both of which were very tasty but overcooked. This left the broccoli a little limp and the fondant a little too soft. There was also some stuffing of course, which I found a little too bread-y but otherwise, this was an enjoyable dish – a real hearty and filling English feast. Dessert was a raspberry soufflé (£6.50). 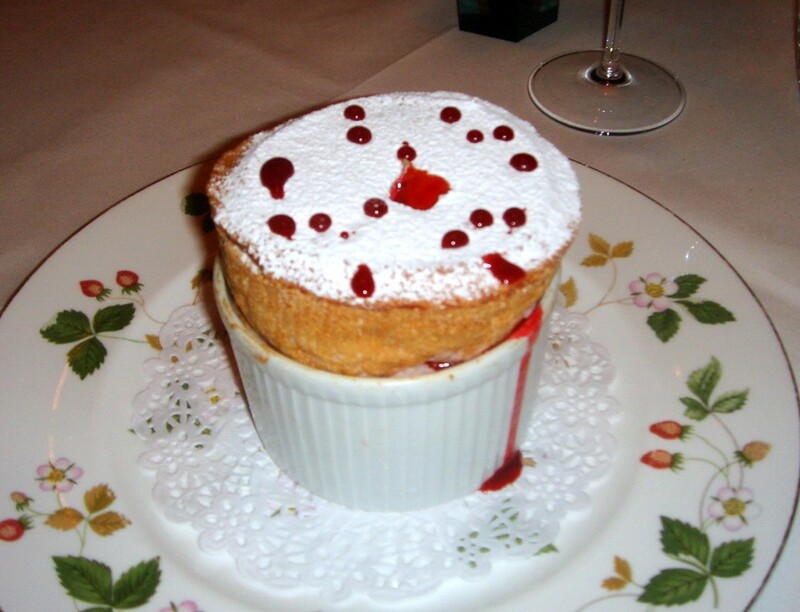 It’s not raspberry season, but I am a sucker for a soufflé and this was nicely done. It was finished with a drizzling of thick, sweet raspberry sauce at the table, which when eaten with the soufflé gave it an added dimension. Soufflés can sometimes be too eggy, but this version was well-balanced. For a restaurant pitched at the fine dining end, the service was probably one waiter short for the number of covers. On occasion, it took a couple of minutes longer than it should have to get any attention. But the service we did get was very good, although the head waiter seemed a little snooty. With the exception of the foie gras terrine (not bad, but not amazing) and a couple of overcooked sides in the roast chicken dish, the food on the whole was excellent, well executed and beautifully presented. I found the pricing reasonably fair for the calibre of cooking that we had. And the fact that we had this meal on a ‘50% off’ special through TopTable made it even better value (bonus points to LD who made the booking – another sniff). These 50% off deals aren’t something I always indulge in (I’ve tried several of these offers in the past and some of the food hasn’t always been worth having, even at 50% off). However on this occasion, I couldn’t help but think what great value we had (this offer is currently available until 28 February 2010). The only real drawback I can think of is the setting. It’s nicely done, but it’s just a touch too sombre to really engage with the diner. Price range: 3 courses from £29 to £52. Excludes drinks and service. The wife wanted to try this on the 50% offer too. Not sure why but we never made it there. Sounds like it’s not a bad deal with 50% off. I thought this place was pretty over the top. Could totally imagine myself a footballer’s wife, sitting here. When I went, the restaurant was EMPTY. Scarily so. But that was ages ago.